Avoriaz is one of several stunning resorts, in the heart of the Portes Du Soleil ski area, where REAL Snowboarding teach, instruct, coach, and play. A purpose built, car-free, architectural wonder atop dramatic alpine cliffs – it’s hard not to fall in love with the unique ski resort as you glide over its sharp, sloping rooftops for the first time on the Tour chairlift. Nestled inside this cozy mountain retreat is a plethora of self-catered apartments, charming wood-clad hotels and plenty of cool shops, restaurants and bars to cater for all tastes – all served by horse-drawn sleds, and snowy foot tracks. It’s no surprise Avoriaz is one of the ski resorts REAL Snowboarding call home, and thousands of keen skiers and snowboarders visit every winter. Learning to snowboard demands a variety of terrain, ranging from gently sloping green runs for beginners, to more challenging pistes for more advanced riders to enjoy. Fortunately, Avoriaz has everything a snowboarder needs from their very first lesson, right up to competitive snowpark riding. The Burton Stash provides limitless creative opportunity for those looking to take their freestyle snowboarding to the next level, whilst the wide, long pistes in the Lindarets bowl provide fun side-hits, groomed pistes for carving, and quiet spots to link turns for the first time. 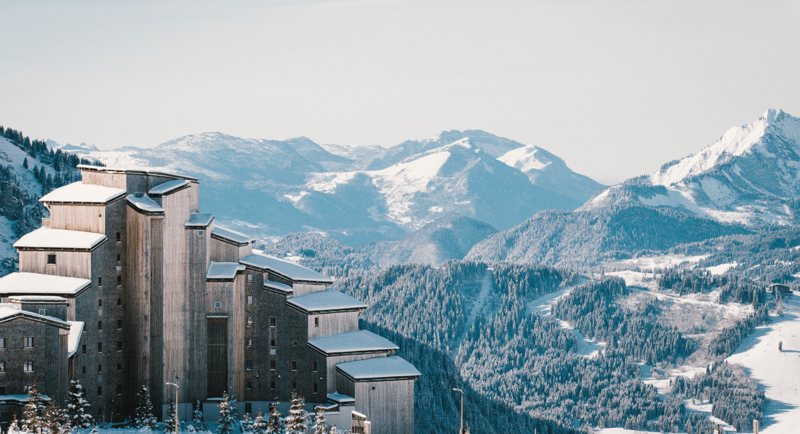 For those of you looking for something a little different to the quaint french village vibe, make your next winter holiday a trip to Avoriaz. There really is nothing like the experience of the sun setting through the Morzine valley, behind the stunning shapes and outlines of Avoriaz’s chic buildings there really is no going back. Unique amongst the many purpose built french ski resorts of the 1960s, Avoriaz was designed by architects Jacques Labro, Jeans-Jacques Orzoni and Jean-Marc Roques with acute angles and red cedar wood cladding to resemble the very mountains that surround them. The result is breathtaking, and looks like an extension of the sunny shelf on which the buildings rest. We always set our snowboard lesson meeting point at the top of the very accessible Prodains Gondola, with snowboard lessons beginning in the morning, mid-morning, and afternoon. Getting to the Prodains Gondola is easy peasy, whether you’re staying Avoriaz itself, Morzine, or Les Gets. With free, regular bus shuttles throughout the resorts, it’s usually just a quick bus ride and a swift whisk away up the alpine cliffs, with beautiful views to get your stoked. Book your beginner, improver, intermediate, or private lessons with REAL Snowboarding on your next winter holiday to Avoriaz and learn to ride the REAL way.